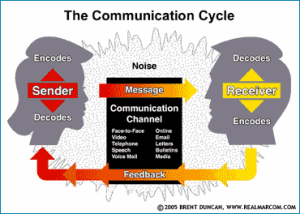 Communication occurs when a sender transmits a message and a receiver understands the message. An effective communicator independently alternates as a sender and a receiver regardless of the demands of a conversation including settings (e.g. community, school, work, home), conversational partners and topics. All methods of communication performance are considered in determining the CFCS level. To find out more about the GFCS have a look at this page. These children can have problems speaking with a clear voice because the muscles of the trunk are weak and this also influences the loudness of the speech. If children who have problems with speaking are not given an alternative to speech, they may have difficulty sending a response and the communication cycle will break down. Try to touch the nose, cheek, and chin with the tongue. Who is doing best? Try to blow a ping-pong ball or a piece of cotton wool away: who is the best? Can you blow further than last week? Speech and Language Therapists or Occupational Therapists will ideally be involved in the treatment and development of speech with the child with Cerebral Palsy. In this video an Occupational Therapist talks about the problems and treatments for communication difficulties in children with Cerebral Palsy.